Like most of you I love a packed fridge. It's so much better to open your fridge and get swamped with choices. For that matter Saturday is my most favourite day when I go to the market and bring fresh veggies, fruits and herbs for the whole week. With winter slowly creeping in it is flooded with colour and so much rare veggies. Just the other day with Dhenki shaak (fiddle head ferns) I also got Touk Dhyarosh or Rosella flowers. They definitely came home and I spent a whole afternoon being nostalgic and making something that my mother used to make for us. When it comes to veggie shopping I try to follow the memories of how my grand father used to shop. First he would check for the freshest veggies available on that day and then after deciding on them he would buy the accompanying veggies for the meal. for example if he bought spinach then definitely a few pieces of radish, brinjal and taro roots would find their way in his shopping bag, similarly a cabbage will always come home either with fresh peas or an extra fish head. 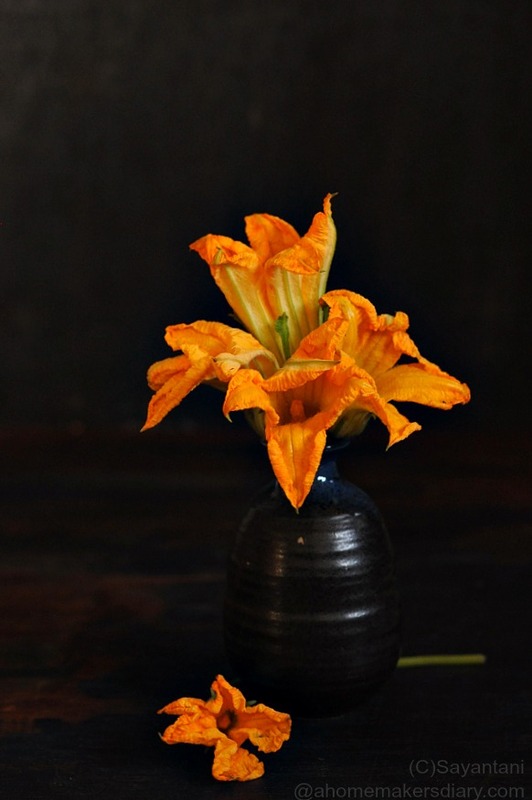 This weekend I got fresh Kumro phool or pumpkin flowers. It was so fresh as if the pumpkin patch was just behind the shop. After buying it I headed straight to the fruit vendor to buy a small coconut. When the flowers are this fresh no normal fritter recipe could do, it has to be my grandma's stuffed fritters with coconut, mustard and poppy seeds paste. Though I have given the measurement for the stuffing but you should just follow your instinct. if you like pungency then add more mustard, you can even discard the poppy seeds paste. Just make sure it tastes good. Wash the flowers under running water. Put your fingers inside the flower and carefully remove the stigma. Drain it on paper towel. Mix the poppy seeds, coconut paste, mustard paste and chilli paste with a pinch of salt. I put everything in a blender and make a paste. put generous amount of stuffing inside the flowers and keep ready. To make the batter use the chickpea and rice flower with pinch of red chilli powder, nigella seeds and salt as per taste. Make a thick coating batter like a pancake batter. Heat oil for deep frying and put a tsp of hot oil in it with the soda. mix. 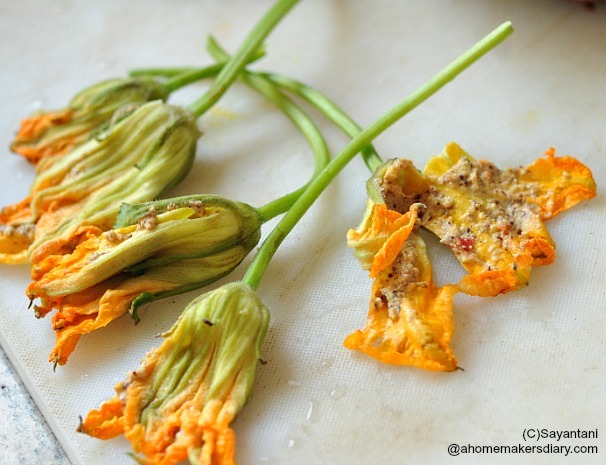 Dip the stuffed flowers in the batter and fry on medium heat till both sides are golden. 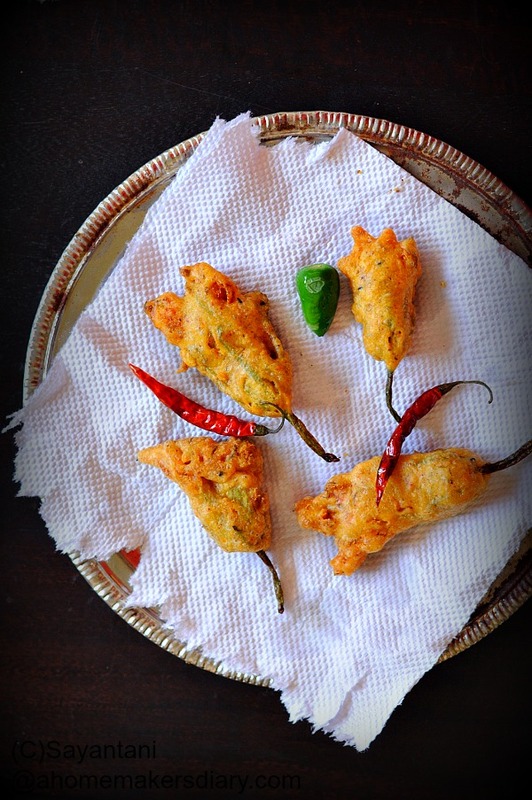 Serve immediately with rice and dal or as a tea time snack. The stuffing could be made with whatever spices you like. Coconut, mustard chilies and poppyseeds are just options. Do whatever you like and throw everything in a mortar and pestle and make a thick paste. Preferably without any water for it to stick to the delicate flowers. Do not apply the paste and let the flowers sit for long. 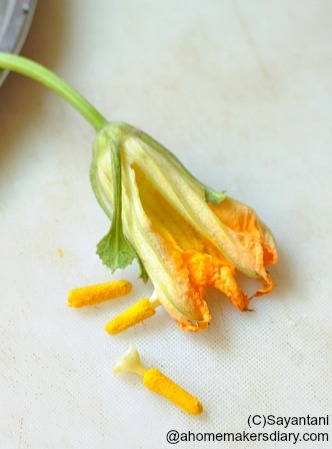 The salt and water of the spices will make the flower soft. Here we have no chance to savour this delicacy. Very nice I like to try it when I can get hold of blossom flower. every year during this time, i remember and search for your fudge cake recipe. why has it disappeared from your blog? My daughter wants me to bake only that every year. where can i find it pl?